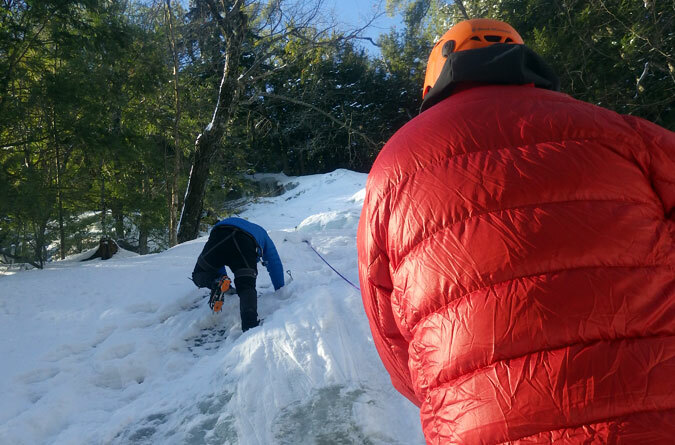 It was the first day of the Appalachian Mountain Club and Eastern Mountain Sports Schools’ winter mountaineering program, and we were staring up a 200-foot ice cliff near Cathedral Ledges in North Conway, New Hampshire. Oh, sure, the pitch was the ice-climbing equivalent of a bunny slope, but 200 feet is still 200 feet to someone who has never donned a climbing helmet and harness. 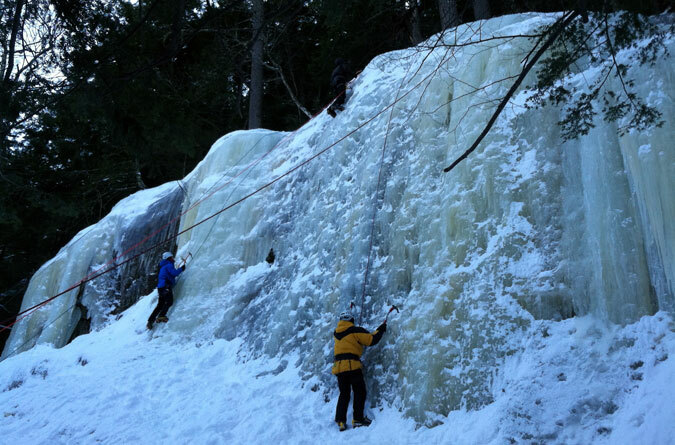 The whole ice climbing bit had come as a, well…let’s go with pleasant surprise. For a program focused on climbing Mt. Washington, I’d somehow missed that the AMC’s course description of “climbing low-to-moderate angled snow and ice terrain” actually meant ice climbing. I’d always wanted to give it a try, but in my mind we were spending the entire day practicing our footwork and self arrests. In comparison, how boring would that have been? One of the first things Dave asked us when we arrived at EMS that morning was, “What do you want to get out of today?” The program has a ratio of one guide to four students, so there’s opportunity to customize the activities to the skill level and interest of the participants. That there was only two of us in this course, plus an AMC naturalist acting as a “liaison,” there was little doubt we were in for a fun-packed day. Mention of wanting to experience roping up with a harness was all Dave needed to hear to deliver what he was likely planning anyway. The ice cliffs. What had begun with Dave inspecting our gear and outfitting us with the missing pieces, transitioned to him teaching us to engage the crampons with the slope through the duck walk, French, and hybrid techniques, now had us standing at the bottom of the 200-foot cliff learning how to tie a figure of eight knot. All of a sudden it was my turn to go up. “On belay?” I asked Ken, the other course participant who, by virtue of manning the belay rope, now held my personal safety in his hands. Or was it, “Belay on?” Leave it to me to screw up the essential piece of the lesson. Gravity certainly wasn’t going to care about my sorry tush. I dug my crampons into the cliff, doing my best to engage all points and keep my body centered above my feet as Dave had instructed. 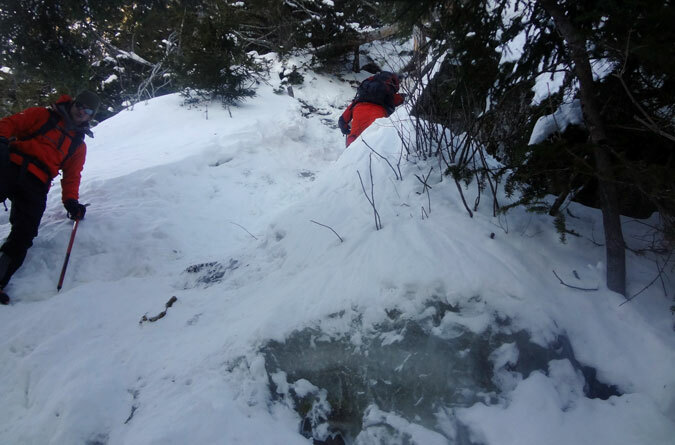 The lower 100 of the cliff was more akin to a mountaineering slope than an ice-climbing slab, so we were doing it with a single mountaineering axe. Slow and steady, I dug the axe’s spike into the crusted ice and crossed my back leg over my front foot, utilizing the newly learned French technique. So far so good. Making my way up the ice cliff. 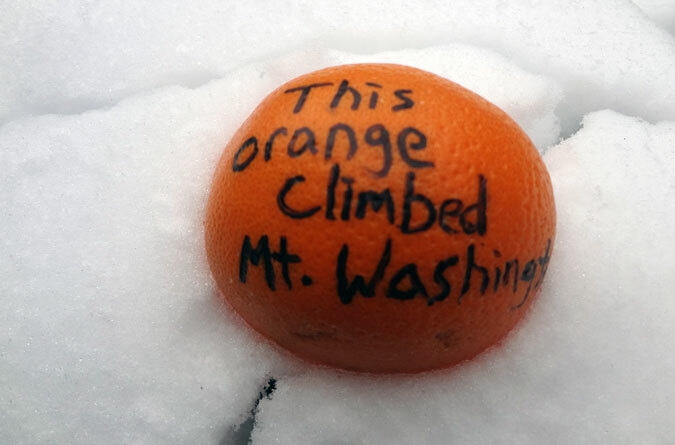 Image courtesy of Stefan Shapiro, Appalachian Mountain Club. Then I came to an iced-over outcropping. I tried to dig the axe’s pick into the ice, but it wouldn’t take. When I reached the anchor Dave instructed me to lean back into the rope and slowly backpedal down. This was a giant leap of faith at a 100 feet up, but once the rope caught it was thrilling, likely the closest thing to being Spiderman that I’ll ever experience. Next up was another assault of the cliff. This time Dave went up first to belay us from above, and once we all reached the mid-point he did it again, having us double-pitch the entire 200-foot cliff. While the bottom half was more on the mountaineering side, the top portion was closer to actual ice climbing, and for this we double fisted two axes. It’s hard to put into words the nervousness at climbing the top portion. Fear of falling wasn’t the issue, because I trusted Dave’s expertise and the gear; it was more the thought and embarrassment of not being able to do it. All of which made the rush of reaching the top equally challenging to describe, other than to say it was so flippin’ cool. Bucket list—check! The fun wasn’t over yet, however. We quickly ate lunch and then hiked to the top of Cathedral to enjoy the views on a bluebird day. 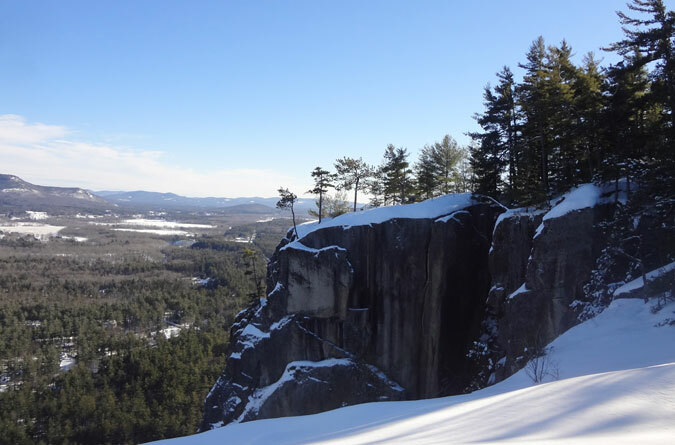 Approaching the summit of Cathedral Ledges. On the way down Dave had another surprise in store. We were to repel a steeper section of the ice cliff. The difference with repelling is that we lower ourselves. As I backed over the top of the cliff it was another lump-in-throat moment—mostly because I did what I shouldn’t have, look down—that ended successfully in an adrenaline-fueled rush. Climbers on the ice ledge we repelled down. On the van ride back the question was asked if we’d ever climbed Mt. Washington in the winter and why we’d signed up for the course. 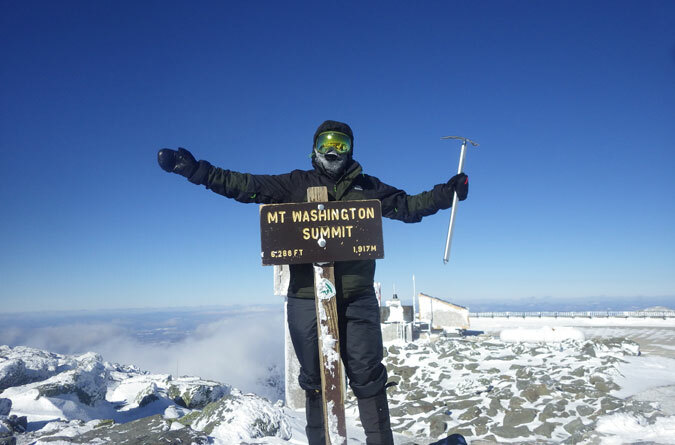 I’d summited Washington twice previously in the winter months, as well as other notable New Hampshire peaks—Mt. Adams, Mt. Madison, Mt. 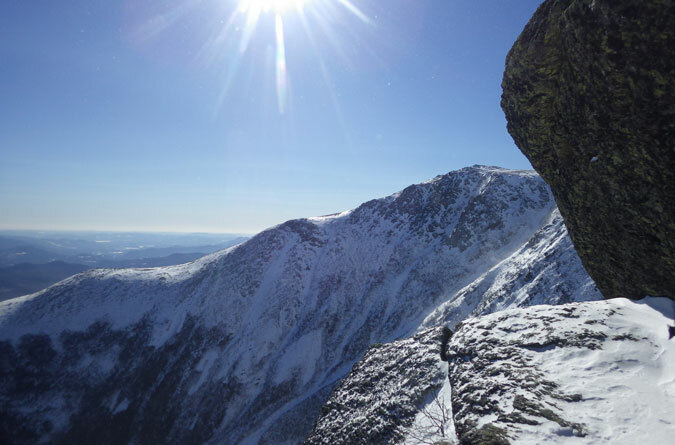 Lafayette and Franconia Ridge, and many more. So why did I sign up? Most of what I’d learned was from first-hand experience and watching YouTube videos on how to use a mountaineering axe. All of which, I knew, wasn’t an adequate replacement for actual training in a sport where one bad decision can have grave consequences. After the first day I was already glad I’d signed up. Cost had been a major factor in delaying the course. The $500 price tag (discounted for AMC members) seems high at first blush, but when you break it down into two nights of lodging, meals from Friday dinner through Sunday lunch, two days of guided service, and EMS gear rentals, it’s a bargain. The gear rentals is the real bonus, which, for anyone new to the sport, could save money in the long run. Some mountaineering boots can cost as much as a snowblower (let that one sink in for a moment), so it’s a great opportunity to see whether a particular brand provides enough support, mobility, insulation, and isn’t a blister factory. What’s more, you get gear advice from actual experts. While I rented hard-sole boots, Dave showed me how to properly set my crampons for winter hiking in soft-sole boots to prevent breaking the crampon. The lesson here is that you’re going to want to pack some supplemental snacks to go along with the lunches provided. We met Craig, our guide for climbing Mt. Washington, in the Pinkham Notch gear-up room early on the second morning. He went through all of the appropriate gear checks—did we have enough water, various glove options, appropriate face gear and goggles, etc. During the early stages of our hike on the Tuckerman Ravine Trail, Craig reinforced the need to mix-up our footwork techniques to work different muscles and conserve energy. It definitely worked. When it was all said and done, my legs were far less fatigued than they’d been after my two previous winter ascents. 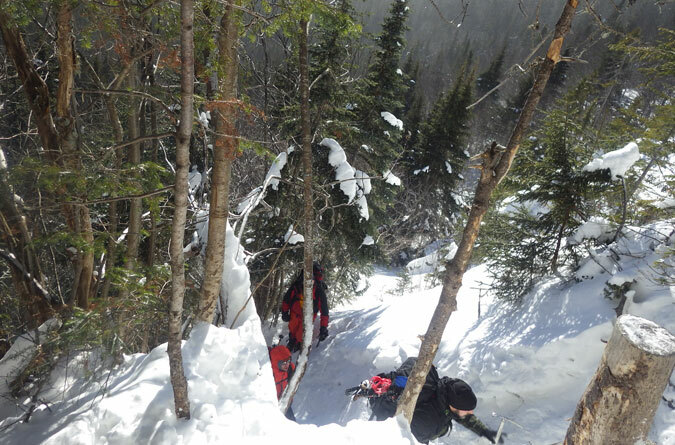 It wasn’t long before we veered onto the Lion Head Trail winter route and traded our microspikes for crampons. A quick jaunt up the beginning of the Lion Head Trail had us staring up a precariously steep section. Looking up into the steep section of the Lion Head winter route. “It’s our own mini version of Hillary Step,” Craig said in reference to Mount Everest’s notorious 40-foot ice wall. He went on to provide instruction on this tricky section that, while we hadn’t realized it at the time, was going to invoke everything we’d learned on the ice cliff the day before. It wasn’t lost on me that we’d previously done the ice cliff with a harness and rope. Not to mention a helmet. I dug the mountaineering axe’s pick into the wall before me, kicked the front of my crampons into the compacted snow for additional leverage, and took a deep breath. This is why I was here. My turn in “Washington Step.” Image courtesy of Stefan Shapiro, AMC. After conquering “Washington Step,” the remainder of this section to treeline is extremely steep, but not so much so that we couldn’t stand upright with the axe and utilize the French step-over technique. 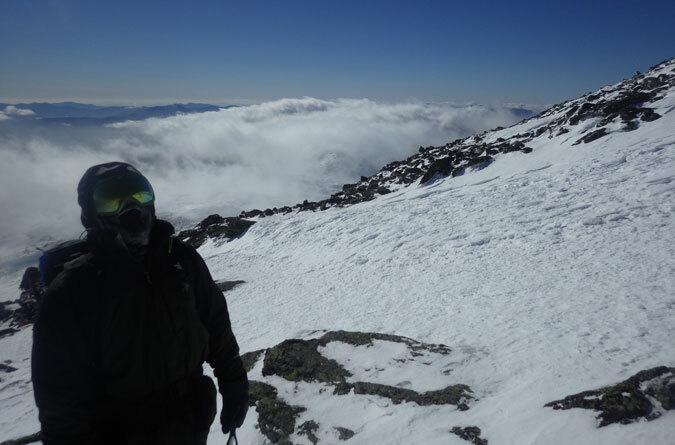 At treeline we quickly geared up in hard shells, goggles, and balaclava. “Next stop, Lion Head,” Craig announced, after informing us that in the wind we’d need to communicate primarily through thumbs-up, thumbs-down hand signals. We took shelter in the Lion Head outcropping for a water and snack break. Having booked the trip a month in advance, I could only cross my fingers in the weeks leading up to the outing in hope that the weather played nice. It worked. The view of Boott Spur from Lion Head. Image courtesy of Stefan Shapiro, AMC. 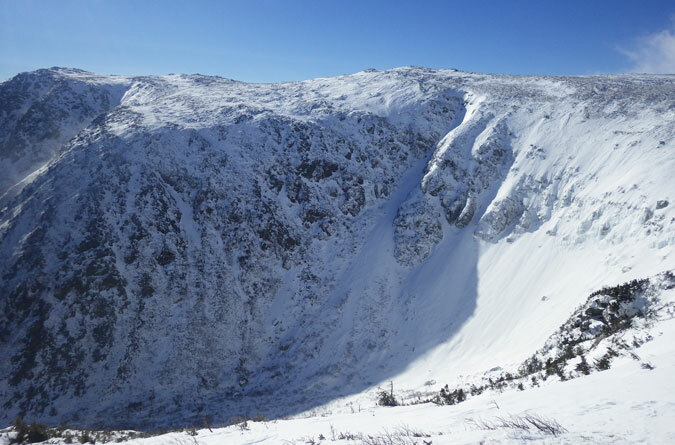 Looking down into Tuckerman Ravine from Lion Head. Image courtesy of Stefan Shapiro, AMC. Craig did a professional job managing expectations. 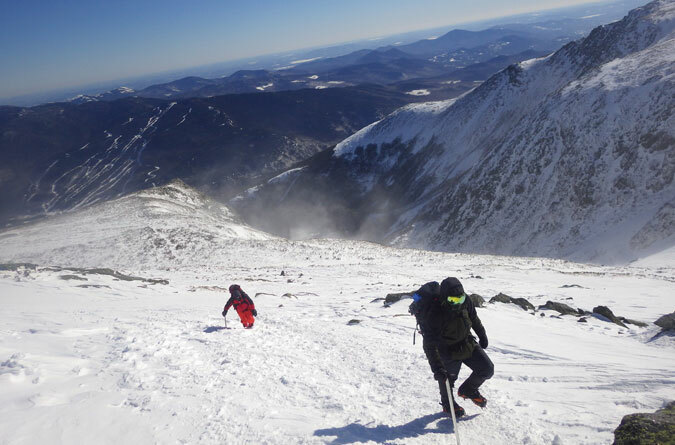 He made it clear throughout that summiting wasn’t a given, and at each break point he’d make the call to proceed based on weather and our physical condition. Fortunately our small group dynamic afforded us the ability to work together, and we each pitched in, lending our back-up goggles to a team member who was battling frost issues. We managed our way through the Alpine Garden winds and reached Split Rock in short order. From here it’s all or nothing up the Washington cone, which is much steeper than it looks from a distance. A good deal of snow collects on the cone, and veering too far off course could send someone into avalanche territory. As an extra precaution, Craig instructed us to keep some distance between each other, even stopping at a horizontal snow crossing to have us run one at a time. This risk minimization was something I never could have learned on my own. Climbing the Mt. Washington cone to Split Rock. Image courtesy of Stefan Shapiro, AMC. Not there yet… Image courtesy of Stefan Shapiro, AMC. The glory of reaching the summit was short lived. We stayed only as long as it took to get photos. I for one wish I’d done it sooner. Success! The wind was pinning me into the sign, I was nervous of knocking it over. Image courtesy of Stefan Shapiro, AMC.